Shrink long distances down to size. 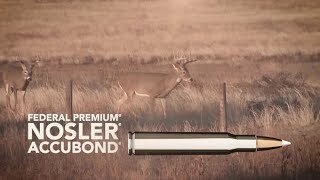 Nosler® AccuBond® rifle loads' proven bullet design pairs a precision polymer tip with a highly concentric jacket bonded to a lead core. The result is fast expansion, moderate weight retention and lethal penetration at long range. Rated 5 out of 5 by Rzeltvay from 6.5 Creedmoor I bought a 6.5 Creedmoor Tilka Extra Light. This is by far the best rifle and ammo match I have ever experienced. These rounds are deadly accurate shot after shot. Even when the barrel starts getting hot. I highly recommend this ammo. Rated 1 out of 5 by AJworm from Disappointed! Shoot this ammo out of my Christensen Arms Mesa LR and it shot about 8" low at 200 yds. Had about 20 rounds threw the barrel that day when I figured i would give it a try, and was very disappointed. Thinking it could be the gun, i switched back to Hornaday Match and was within 1 MOA. I would not even both with this ammo again, unless not hitting your target is your thing then by all means. Rated 5 out of 5 by David 987 from Amazing factory load I got thought this a few weeks ago think it’s just another factory load and wasn’t expecting the results I got. Compared to my hand loads it’s the best I’ve came across. Cover the group at 200 yards with a quarter.